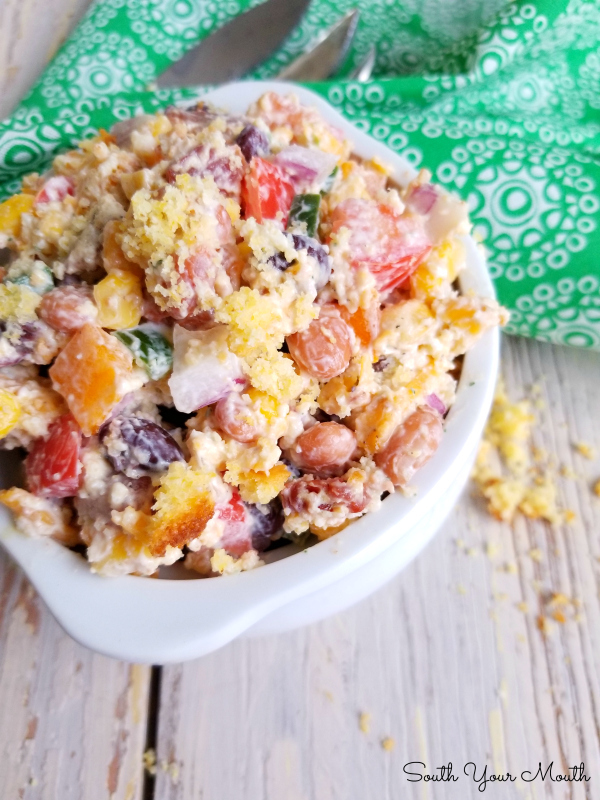 A kaleidoscope of crisp bacon and diced fresh vegetables, creamy beans and shredded cheese tossed with sour cream dressing and crumbled cornbread in a bright, beautiful, fun salad perfect for potlucks, picnics and Sunday dinner. I felt like cooking this weekend. Like, really cooking. I don’t know if it’s because of everything I’ve had going on lately or because of all the fresh local produce in abundance this time of year or what, but the urge to camp out in my kitchen and cook myself blind struck me like a bolt of lightning this weekend. Or maybe my body was trying to tell me something. Have you ever noticed that oftentimes the food you crave can be tied to something your body might be needing? I tend to crave beef when my body needs iron, oranges and grapefruit when I’ve got a bit of a cold coming on, vegetables when I’m worn down, etc. I’ve had about the worst two months a person could have. It started when our beloved 15-year old golden retriever passed away and went downhill from there. I’m not ready to tell you what else my family has gone through yet but I will tell you we have been through the wringer and the stress and fatigue is surely what prompted me to want to cook up a mess of vegetables this weekend. My body needed the nutrients and my heart needed mending and my kitchen is the place where I can take care of both. 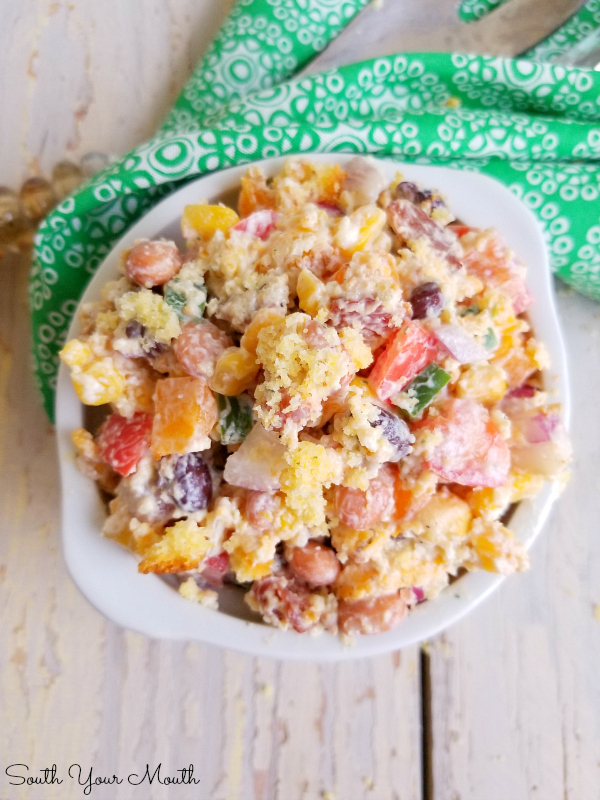 In addition to the absolutely ridiculous amounts of vegetables I cooked this weekend (including these Baby Lima Beans which are new to the blog) I also made this Cornbread Confetti Salad which is chocked full of vegetables. This is my version of a recipe I found flipping through one of my old community cookbooks eons ago. This is one of my favorite things to take to a covered-dish or potluck because you can bet there won’t be another dish there like it! 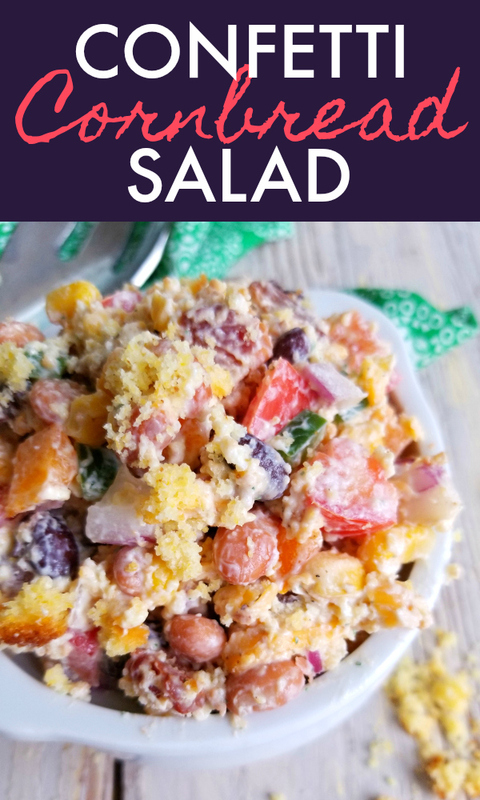 The crunchy veggies, creamy cheese, smoky bacon and rustic cornbread make for the perfect storm in this unique side dish. 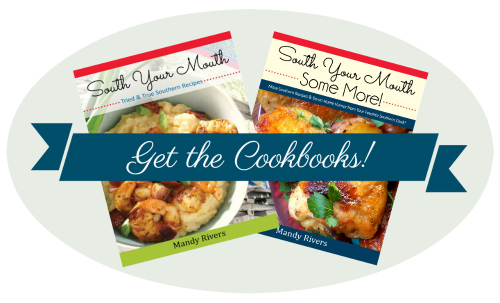 It makes a ton so it's great for entertaining! 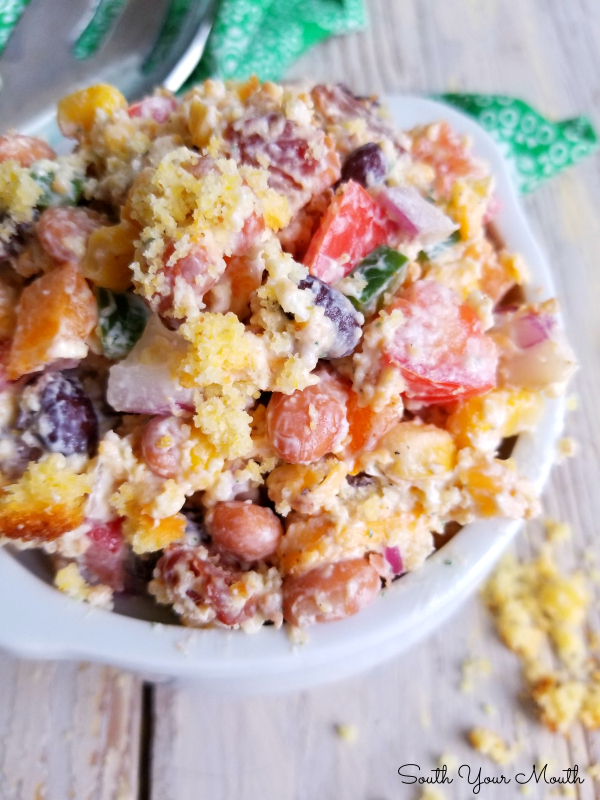 When I want to be fancy I layer the ingredients in a glass dish (veggies, cheese, bacon and dressing layered on the bottom then top everything with the crumbled cornbread) much like a 7-Layer Salad or traditional Cornbread Salad. I've always loved cornbread in salads. You might think this is weird but when I order a big salad anywhere that serves cornbread, I always crumble the cornbread up in my salad! 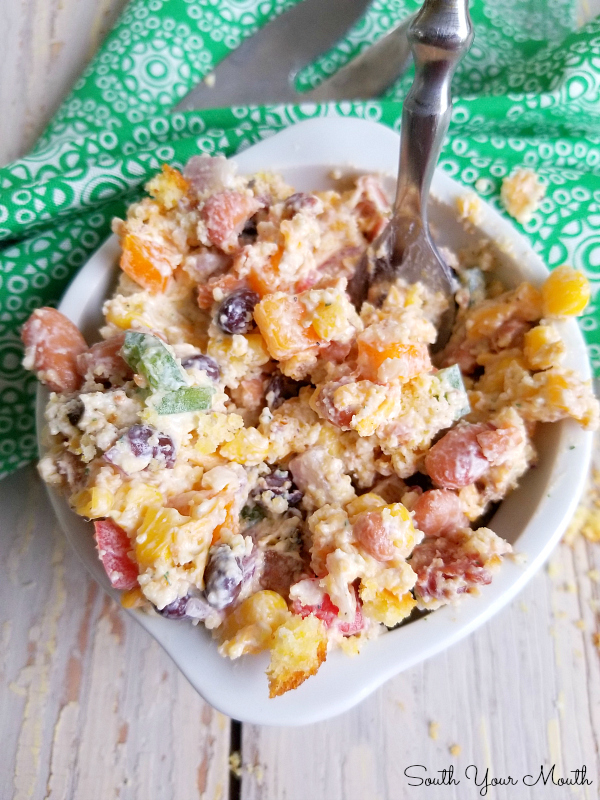 The little meat-and-three restaurant I introduced y'all to with my Baby Lima Beans recipe post has a chef salad with ham and fried chicken and I always get it with ranch dressing then crumble a few of their cornbread muffins over the top! Ain't nothing healthy about it but I sure do love it! The cornbread kinda soaks up the dressing and just takes the entire salad to a whole other level of deliciousness! The original recipe has double the corn and pinto beans and only one packet of ranch dressing mix but I always found it too dry and a bit bland. Feel free to use whichever vegetables you like just try to keep them all diced about the same size so that everything looks like, well, confetti! You could easily double this with a big pan of cornbread and double everything else but this recipe makes a HUGE batch so unless you're feeding an army, I can't imagine ever needing to double the recipe. 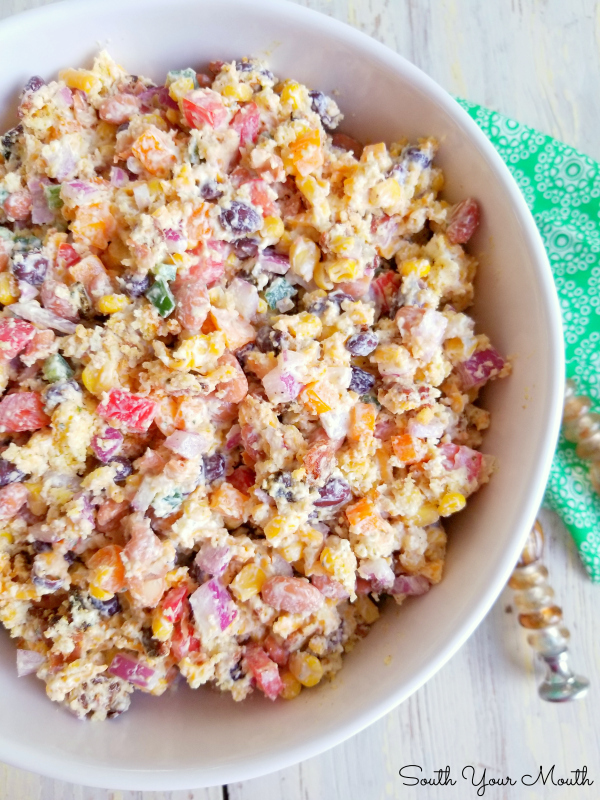 This recipe was shared at Meal Plan Monday! Squash Casserole - A delicious squash casserole recipe made with herb stuffing, sour cream and cream of chicken soup. Prepare cornbread then allow to cool completely (this can be done the night before). Crumble cornbread then add to an oversized mixing bowl. Combine sour cream and ranch dressing mixes in a separate bowl then stir to combine. Add sour cream mixture, bacon and remaining ingredients to the cornbread then gently fold until all ingredients are thoroughly combined. Cook cornbread a little longer than usual until the edges are dark golden brown (you want the cornbread to be a bit on the dry side). I use the pan drippings from cooking the bacon to grease my cornbread pan. The jalapenos do not make the salad spicy (so long as they’re seeded). I use them for a bit of green in the salad. I’ve found that green bell peppers can overpower the flavors of the other ingredients. Been out of my house for 3 months due to water damage -- just getting ready to go home to a virtually new house and a completely new kitchen. 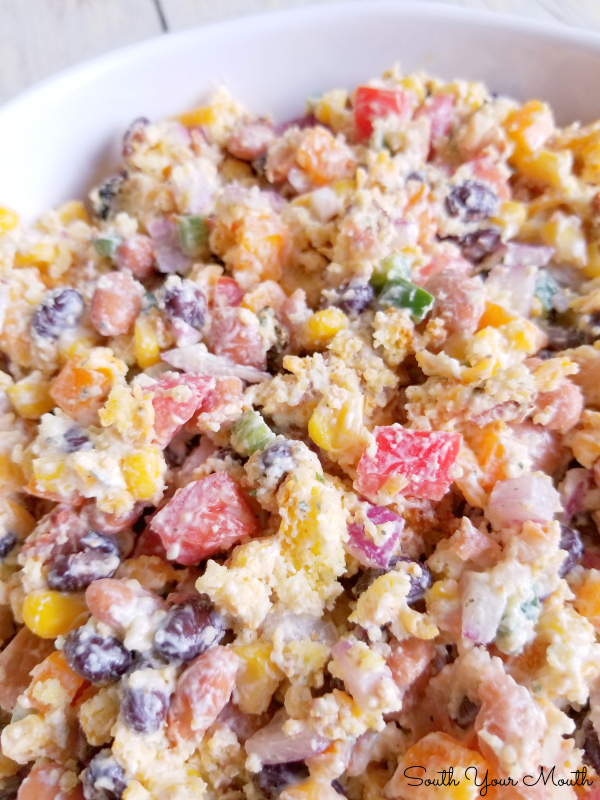 Must be feeling better because I'm looking at recipes again but I intend to try your cornbread confetti salad with multicolored fruit (I'll even have something blue --blueberries) -- Looking forward to trying it! So sorry you've had a rough time. Kinda been there myself and I know exactly what you mean about the kitchen being a safe place. The last couple of months I've been cooking from the past, remembered recipes from Mom, mother in law, grandmother, housekeepers etc. turned our dinners into a retro canvas, but somehow it was just what I needed. If Confetti Cornbread is what helps you through - more power to you for finding the way. Yummy, this looks so delicious! Great side salad dish! Can this be made the day before serving it?